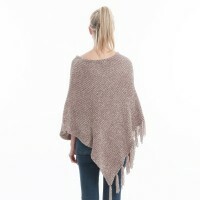 The V-neck shawl-style cloak is wrapped to cover your arms all the way to the upper part of your thigh. The chenille shawl is a nice cover to keep the season cool and cute. Super soft, comfortable and versatile, it can be used as a scarf, poncho or your own creation. It is an easy complement to any outfit, suitable for any season, event or occasion. Available throughout the year, day and night, travel and home, formal events and casual outings, used as parcels, shawls and scarves - just an amazing versatile, must-have item. About Product:*Material: Cashmere-like Acrylic. *Product Dimensions (IN): Length:78",Width:40"*Weight..
About ProductsSize: 82.6x25.6in, including tassels.Weight: 0.6lbMaterial: Imitation c..
About ProductsMaterial: 30% wool 70% polyesterSize: 23.6x70.8inWeight: 0.7lbSuitable ..
About ProductsMaterial: Imitation cashmereSize: 31x11inWeight: 0.7lbSuitable for gend..
About ProductsFabric:50% acrylic/50% polyesterMaterial: imitation cashmereSize:61X51inchWeight:..